1) I love the title. 2) I love the cover. 3) I love Dairy Queen, as it was a big part of my childhood. 4) I love stories about Southern folks because it's a part of who I am. 5) I was raised in a religious home and I get the humor of it all. 6) I am heavily medicated and confined to my bedroom because I'm sick. 7) I needed to read something that felt like comfort food for the eyes and brain. 8) I'm feeling a bit...sorry for myself because it's my Spring Break (refer to #6). 9) It's the author's debut novel. 10) I love Dairy Queen. It is because of these many reasons that I feel sure I am unable to give a fair assessment. That being said, I'm going to give my assessment anyway. 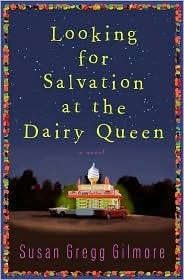 Looking for Salvation at the Dairy Queen by Susan Gregg Gilmore is a charming, coming-of-age type story about a girl growing up in a small town in Georgia. She is the oldest of two daughters, and her daddy is the Baptist minister for the town. All Catherine Grace Cline thinks about, while she sits on a picnic table at the local Dairy Queen eating a Dilly Bar once a week, is how she's going to get out of that town when she's eighteen and chase her dreams. Catherine Grace is a delightfully funny and honest narrator. She uses a combination of phrases and Southern idioms I grew up with and know quite well. She loves her daddy, loves her sister, and loves Jesus. As we all know, we don't question things much when we're young. It's when we begin turning into young adults that we question things and learn we have to find our own way. Things can get a bit...complicated, as they do for our narrator, which makes for quite an interesting story with some surprising turns. Now, while I know this is not Daphne du Maurier, I did give this one four stars on Goodreads. I laughed out loud when I did it. Not because I didn't take it seriously, but because I meant it - wholeheartedly. I have no doubt the ten reasons listed above may have had something to do with that - in fact, I'm sure they do - but it was my heart's honest rating. It also made me feel bad I'd only given two stars to Still Life by Louise Penny, so...I changed it and gave it a three. Yeah, yeah. I know.